All commercial, residential and industrial buildings have lot of parameters which need to regularly controlled and monitored. Apart from comfort and convenience, such automation is essential for monitoring all critical parameters. This is achieved through a Building Management system also known as Building Automation system. All such systems can be connected to internet and can be monitored and controlled from remote locations. Also different buildings in different locations can be combined to a single system for central monitoring. A protocol is basically the communication language used by all the components in the system to transmit signals to each other and to the central processor. 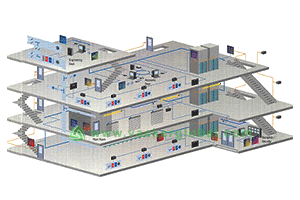 A typical building automation systems will have thousands of such components which need to communicate each other. Prominent protocols are BACnet, Modbus, KNX, Lonworks etc. Different manufacturers of components use different protocols for their components. For any addition of systems at a later stage, components of same protocol need to be used. However interface components are available to use components of other protocols. KNX is an open protocol for which any manufacturer can develop new components. An automated home theater which will automatically reduce the volume and pauses the video when a phone rings.